On the left of this picture (unfortunately rather dark) are two shades of blue from a woad fermentation vat, green from dyer’s broom yellow overdyed in the woad vat and purple from the lichen Ochrolechea tartarea. On the right are some browns from walnut leaves and hulls and alder bark and twigs. The black shades are from walnut, oak and alder plus iron water modifier. Black can be achieved either by dyeing red, yellow and blue in succession over one another, and repeating the overdyeing until a suitable depth of black is reached, or by using the tannin/iron complex. To use the tannin/iron complex, wool is mordanted with tannin, or dyed in a tannin-rich dye such as oak galls, oak or bramble leaves or alder bark, (or indeed a combination of several tannin-rich dyes), then modified in an iron solution. The depth of colour is best built up by repeatedly simmering the fibres in the iron solution, then airing them for about half an hour to allow the colour to develop. This process can be repeated until a rich black is achieved. Unfortunately, this method tends to weaken wool fibres over a period of time, so the dyed materials will gradually deteriorate. However, if you are not dyeing for posterity it is the simplest way to achieve black. The lichen is steeped for several weeks in stale 4-week-old urine (or a solution of 1 part ammonia to 2 parts water), until the liquid becomes deep purple or almost black in colour. The solution should be stirred or shaken vigorously two or three times daily to incorporate oxygen. The liquid is then poured off and water added to make the dyebath. The fibres are then gently simmered in the dyebath for about 45 minutes, then left to cool in the dye liquid. This simmering and cooling process can be repeated several times to increase the depth of colour. 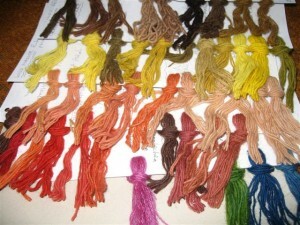 In addition to the colours illustrated by my test samples, many more shades could be achieved by dyeing one colour over another. I think the experiments described in these three posts show that the early Anglo-Saxons would have been able to produce a wide range of colours without using mineral alum or other chemicals dyers tend to rely on today. One of my aims as a dyer is to achieve reliable colours using a minimum of manufactured chemicals and the results of these tests indicate that there is further scope for experimentation in this area. This shows some of the range of shades from madder (Rubia tinctorum) on the left, and weld (Reseda luteola) and dyer’s broom (Genista tinctoria) on the right. The mordants used were clubmoss mordant, tannin mordant (oak gall or bramble leaf solution) and no mordant. The modifiers used were clear vinegar (acid), wood ash water (alkali) and iron water. For the deepest black shades from tannin-rich materials, such as alder bark and oak galls, I used an iron water mordant followed by an iron water modifier. Too much iron does, of course, weaken fibres but iron water is slightly less harmful in this respect than the chemical ferrous sulphate. For a brownish purple shade from madder I used an iron water mordant followed by a wood ash water (alkaline) modifier. Where appropriate for comparison purposes, I also dyed some samples using wool mordanted with 10% alum. For a further test with madder, I added chopped crab apples to the dyebath. I remembered reading about this some time ago, although I’m afraid I can’t recall where, and thought it worth trying out. 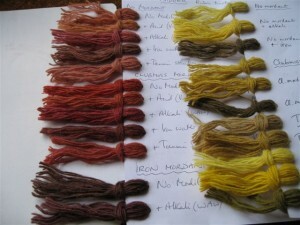 I was pleased with the results, as this dyebath gave brighter, clearer shades than those from madder used alone and worked particularly well on unmordanted wool. To make wood ash water, remove the wood ash from a wood-burning stove, put it in a bucket or large lidded container and fill up with water. The leave the mixture to soak for several weeks. By this time the liquid will have become yellow in colour & feel “slick” or slimy to the touch. To use it as an alkaline modifier, remove the liquid without disturbing the ash sediment and soak the materials in it, adding more water as necessary. It’s better not to apply heat, as this may harm woollen fibres. 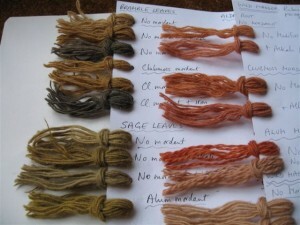 Unfortunately the photos don’t show the colours to their best advantage but I was pleased with the results of these tests, which indicated that the early Anglo-Saxon dyers would have been able to achieve a wide range of good, strong colours using only readily available materials and without using mineral alum as a mordant. As far as light- and wash-fastness are concerned, I imagine these would have been of less importance to the Anglo-Saxons than they are to us today. Clothing was probably not washed as frequently and, if colours faded, clothing could be re-dyed relatively easily, especially as most of the dyes I used in my tests can be applied using little or no heat. As most garments were loose-fitting, a small degree of shrinkage might not have mattered too much. However, the classic dyes, madder, weld and woad, and the tannin-based dyes, such as walnut, oak leaves, oak galls, alder and bramble, all have reasonably good fastness properties, even when used without a mordant, so fading would not have been too much of a problem. 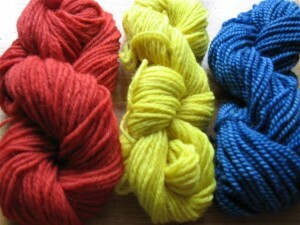 These are the classic dyes: madder, weld and woad. I have always been interested in researching the dyeing methods of the past. The Anglo-Saxon period (cAD450 – AD1066) is one that particularly interests me, especially the early Anglo-Saxon period (AD450 – AD700). There is much evidence that, even at this relatively early stage in our history, craftspeople were highly skilled and capable of remarkable levels of craftsmanship, including textiles woven using a variety of sophisticated and complex weaving techniques. The Anglo-Saxons had a variety of naturally-coloured sheep breeds, ranging from beige and brown to grey and black, so some colour patterns could be achieved without the use of dyes. 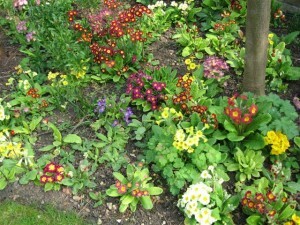 However, dyes were necessary to achieve truly bright shades and to extend the colour palette. One thing that is still not clear is whether the dyers of the early Anglo-Saxon period would have had access to alum mordants. Alum shale was not discovered in England until the 17th century and before then alum had to be imported, mainly from the Mediterranean. Most experts seem to doubt that mineral alum would have been available widely, if at all, in England during the early Anglo-Saxon period, although it is certainly possible that the necessary trade routes may have been established. Nevertheless, it is perhaps unlikely that a product like alum, that had to be imported, would be readily available to everyone, and most probably more humble dyers would have had to manage without it. So what colour range could they have achieved without using an alum mordant? And what alternative mordants or fixatives might they have used? These considerations formed the basis for my experiments. The purpose of my tests was to investigate some of the range of shades available to dyers of the period, using only materials to which they would have had easy access. So as my main mordants I used aluminium extracted from clubmoss (see below for more details) and tannin from oak galls, with iron water, vinegar and wood ash water as colour modifiers. 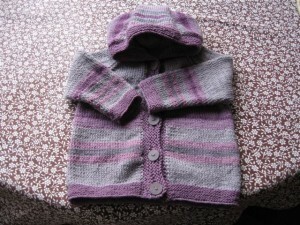 As wool would have been the main fibre used by most people, I limited my tests to wool only. Linen and hemp were also used in the period but they appear to have usually been left undyed. To prepare the tannin mordant, I simmered 50gms of oak galls for about 30 minutes, strained off the liquid and then simmered the fibres in this solution for 30 minutes. This oak gall solution can be stored and re-used several times. As a result of this mordanting process the fibres become light brown in colour and this sometimes has an effect on the colours dyed on a tannin mordant, making them darker or duller. Although mineral alum may not have been available, excavations at the later Viking Age (Anglo-Scandinavian) site in York (9th – 11th centuries)indicate that dyers there probably used a mordant prepared from clubmoss, which has the ability to accumulate aluminium from the ground in which it grows. However, as the particular clubmoss species found (Diphasium complanatum) is not native to Britain, it is thought likely that it was brought by the Vikings themselves, who were probably familiar with its use as a mordant. Diphasium complanatum is not the only clubmoss capable of absorbing aluminium and it is possible that the Anglo-Saxons may have also used a native species of clubmoss as a source of aluminium for mordanting. Based on this possibility, I decided to try this as part of my experiments. Extracting aluminium from clubmoss is not easy and I would recommend it only for research purposes. I used fir clubmoss, imported from Europe as I did not have access to any locally, but the extraction process takes several days, during which time the liquid has to be kept fairly hot, and application to the fibres takes a similar length of time. I used a recipe from Scandinavia that I happened to come across in a dyeing book from Germany, “Farben aus der Natur” by Gretel Fieler. (Recipe details below) Using alum-mordanted wool and unmordanted wool as controls, my tests with madder indicated that I did indeed manage to mordant my wool samples with aluminium from clubmoss. 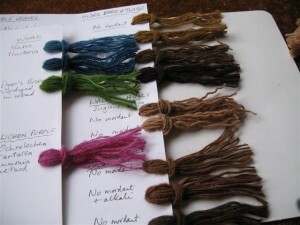 The resulting shades were very close to those achieved on an alum mordant and certainly redder in tone than the shades produced on unmordanted wool. But more about that later. Recipe for clubmoss mordant (Lycopodium selago) : Use 100% clubmoss, chop it into small pieces, then pour water over it and heat the mixture to 40C. Keep at this temperature for 3 days, then boil up the mixture once briefly, strain off the liquid and leave to cool. Then add the wool and heat slowly to 40C. Repeat this heating process daily for 3 days. 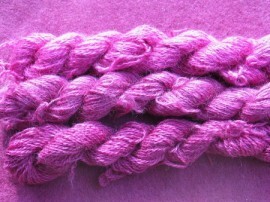 Allow to cool, then remove the wool and rinse. As far as dyestuffs were concerned, for blues I used woad (Isatis tinctoria) and for purples I used the lichen Ochrolechia tartarea. Lady’s bedstraw (Galium verum) and wild madder (Rubia peregrina) were used for orange and coral shades, and weld (Reseda luteola) and dyer’s broom (Genista tinctoria) for yellows. Madder (Rubia tinctorum), the source of red dye, is a little more problematic. Although madder was available and used during the Roman period, it seems to have disappeared for a while with the departure of the Romans from Britain, suggesting that the dyestuff, rather than the plant, had been brought by the Romans. There is evidence, however, that cultivated madder was in use by the 7th century, so I included it in my tests. Various tannin-rich materials, such as alder, bramble, oak and walnut, were used for browns and black. Walnut, although not native to Britain, was probably introduced by the Romans and there is some evidence that walnut would have been available during the period. The test results were interesting and provided a wide range of strong colours. This image shows a selection of colours from my tests. In Part 2, I will start to describe the experiments in more detail. It really seems that Spring has arrived. 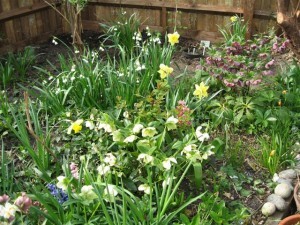 The woad seeds have germinated and I also have seedlings of basil, tomatoes, calendula and zinnias. Only the weld has so far failed to germinate but I will be patient a little longer. 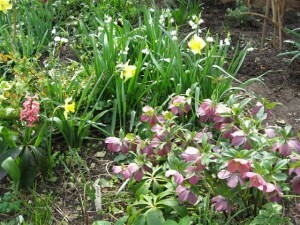 Here are some photos of my garden as it is this week. Just to see the lovely Spring colours and to smell the fragrance of the flowers as I walk through the garden lifts my spirits.